Hint: Sometimes you end up with a problem where the information doesn't come all mashed up together in one data set. Sometimes you have to find half of the data in one place, and half of the data in another. Then you have to figure out some way to merge the two together. Is that enough of a hint? Discussion group: I've set up another Discussion "SRS Discusses High Altitude Lakes in California with Fish" You can click on that link to join in the discussion. The advantage of joining this group (which will be around only until January 10, 2015) is that everyone can post to the group list and don't need to wait around for me to approve their posts. It's also slightly more flexible for posting, and in general allows for a faster turn-around without having me in the loop. One weird trick: Sorry... I couldn't resist using this ridiculous trope that you see all over the net. But this one is really good, and it has significantly changed the way I work. On a Macintosh computer, if you do a CMD+space (that is, hold down CMD and then press the space-bar) it will automatically open Spotlight, the Macintosh OS tool for searching files on your computer. This is now the way I launch nearly all of the apps I use. This is the way I look for 90% of the files I need to locate on my computer. I just start typing the name of the app ("Snagit") and Spotlight creates this list of hits. 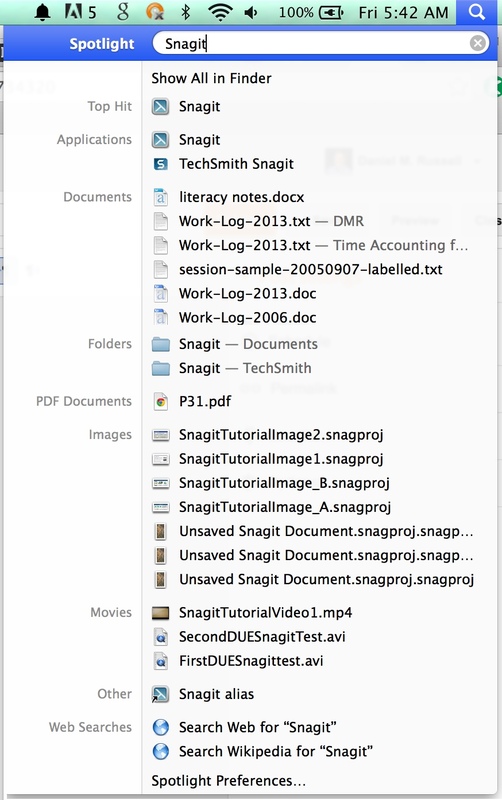 Apps, documents, unfinished projects that have the term "Snagit" in the filename. The first one is the app itself, so I just hit ENTER to launch the app. ENTER will open anything that's listed in the "Top Hit" slot below. Now here's the nice thing: This works for almost everything on the Mac. 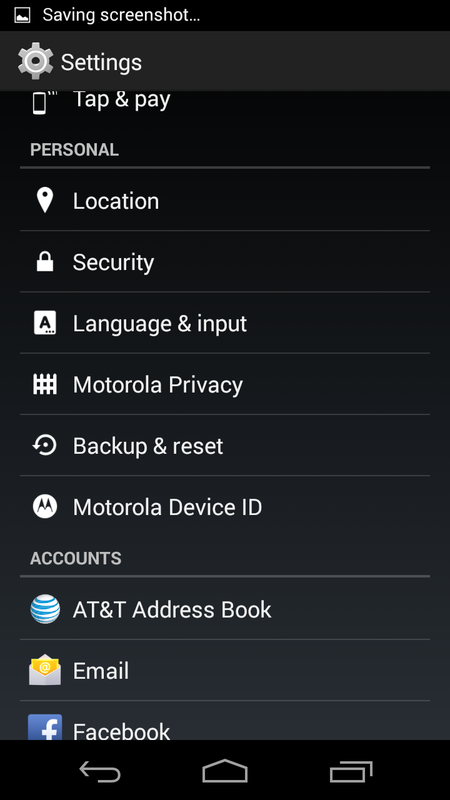 Apps, files, and printers! Need to open the printer queue? CMD+space and start typing the name of the printer--when you see it appear in the list, just hit ENTER to open the control panel for the printer. Of course, the Spotlight list doesn't show everything when the list gets long, so sometimes you need to click on "Show All in Finder" to see the full list. At that point, you can use all of the other Finder file-filter operators, and hone in on the target of your search. If you're a Mac person, this is a skill you really need. Check it out! Windows folks: Is there an equivalent on the Windows side? Let us know! Quick reminder: I'm going to be mostly away for the next couple of weeks. As promised, today's Challenge is a bit more challenging than most during the past year. First, let me present the Challenges, then give a couple of hints. There are three pieces to this Challenge. Both wrapped in a bit of a murder mystery story, just to get your creative juices flowing and to keep you motivated over the next couple of weeks. Little Rob was found dead of unknown causes in his apartment. Near his body were scattered the contents of the rucksack he was packing, clearly anticipating a trip to the mountains. 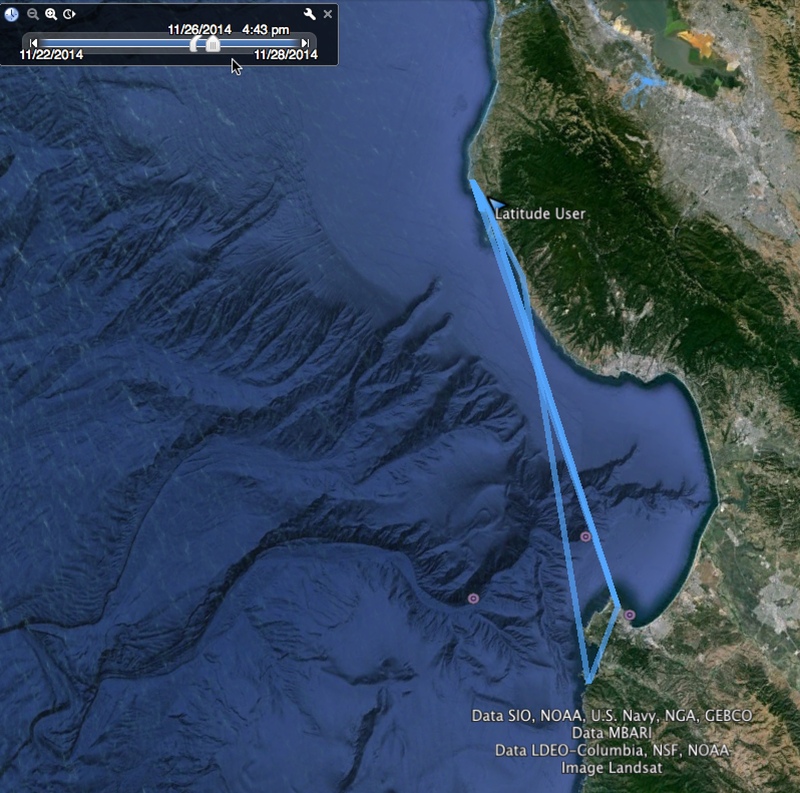 In the pack was a vial of Acetazolamide pills, lots of fishing gear, and a road map of northern California. For food he only had breakfast and lunch, so the suspicion for the murder falls on his hiking partner, Big Jim, who dropped one packet of freeze-dried dinner on his way out the front door. There is also a list of larger lakes and reservoirs that have recently been stocked, with several circled as places to go fishing. Unfortunately, the piece of paper was torn in half, with most of the information missing. Your job is to try and find Big Jim. Given what you know, you decide to start your search on high-altitude lakes in California that have been stocked with fish. 1. Can you find all of the lakes and reservoirs in California that have been stocked with fish in 2014, in Northern California, and are above 8,000 feet in elevation? 2. Since you know they're interested in fishing in larger lakes, can you find those Californian lakes more than 8,000 feet high that are also greater than 500 acres in surface area? 3. How do you know that Little Rob and Big Jim were planning on fishing at high altitude? This is one of those problems that sounds crazy hard, but once you know how to do it, doesn't take that long to do. So the question comes in two parts: (a) What information do you need? (b) How can you handle this information to answer the questions? ▶ If you're doing it one-lake-at-a-time, you're doing it wrong. It'll take you roughly forever to find all the lakes of California, then find the altitude, then find whether or not they'd been stocked in 2014. You might want to chat amongst yourselves this week as you tackle this problem. I know it sounds impossible, but it's not as crazy as it seems. My real goal in this Challenge is to show you a new way to gather, collect, and organize data that you can find in your searches. Once you've found this way, you'll have another powerful tool in your SearchResearch armamentarium. Where did I get the original file from?? 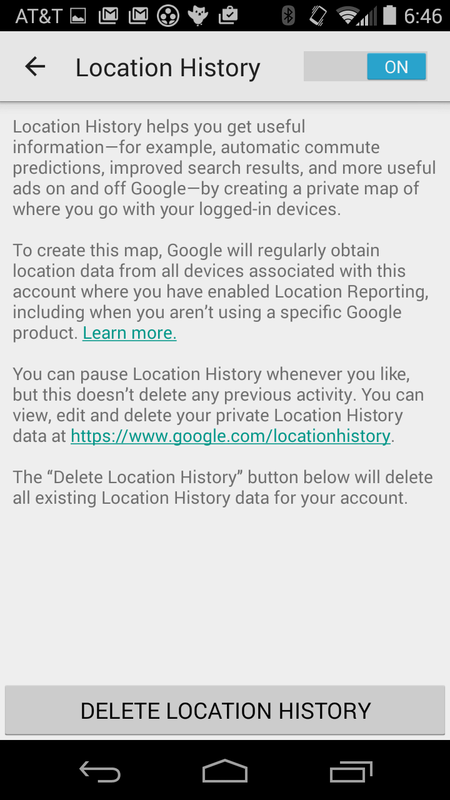 It turns out that if you have Location tracking turned on (see the earlier post about this), your Android phone updates your location history every few seconds... when it's turned on. 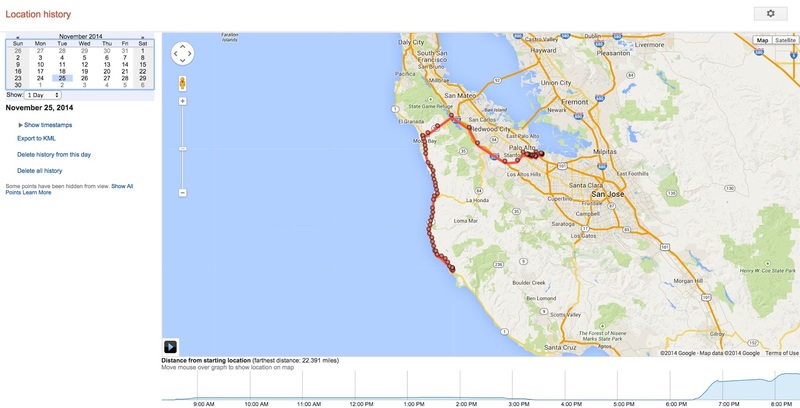 This is my travels on the date of Nov 25, 2014. The bar across the bottom is an interactive slider that you can move along the timeline to determine distance-from-starting-point. You can see that around 6:30PM I started driving and arrived at our destination at 8PM. That produces a master KML file that looks like this. You can see I started in Raleigh (at the Carolina Inn, if you wanted to zoom in on this map), flew cross-country, and the rest you already know. This visualization tool is pretty nice. But--darn it--I wasn't able to find a way to import data into it. It's really a tool for looking just at your own data. I've discovered that it's pretty handy to reconstruct where I've been a while back. Don't remember what you did last Tuesday? Look it up. 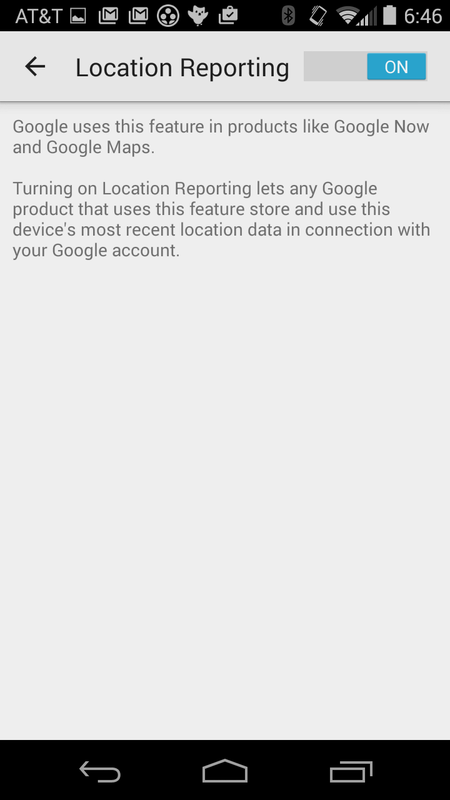 Check out your own location history! Learn anything about yourself? Answer: What was the best Search Challenge of the year? Thanks... for all your comments, both on list and through DM. It's great to have such a dedicated and thoughtful set of SearchResearchers; I appreciate all of the time and energy everyone puts into their comments. It was great fun to read through the comments. There were some posts that definitely brought back memories. Like many of you found, the change in the Challenge / Answer timing has been a blessing in disguise. When I started the Challenges, I was hoping to get people to answer as quickly as possible, and the 24-hour cycle was intended to be a mild stimulant to help things along. But then as the Regular Readers pointed out, many people don't live on the 24-clock, and since some of the Challenges were a bit... well, challenging... it made more sense to stretch the cycle time out a bit. What I hadn't realized is that it gave ME more time to think about the best answer, and let us all take on much harder Challenges than ever. If you go back to 2013 and compare with 2014, this year was much more impressive. Nice work, team! This searched only posts from 2014 (since that's part of the URL for each challenge), and the intitle: operator limited the results to just those posts that were titled "challenge..."
This is a nice search because it finds exactly 49 posts, reflecting all of the posts in the year until this point. I then changed my "number of search results shown" to 100 (you can do that in Search Settings--in the gear icon in the upper right, and now I have a complete list of all the posts! Browsing through here is a trip down memory lane. We sought out answers about Music ("what's a plagal cadence? "), the Other Side of Buildings (discovering ways to date things in the world), Statues in London, How Dan can run on water (mislaignments in geo data), the Price of Horses in 1918, making snowfall maps (visualization tools), how to find out the price of properties in NYC, and Titanic Triggerfish. Remember this Challenge? 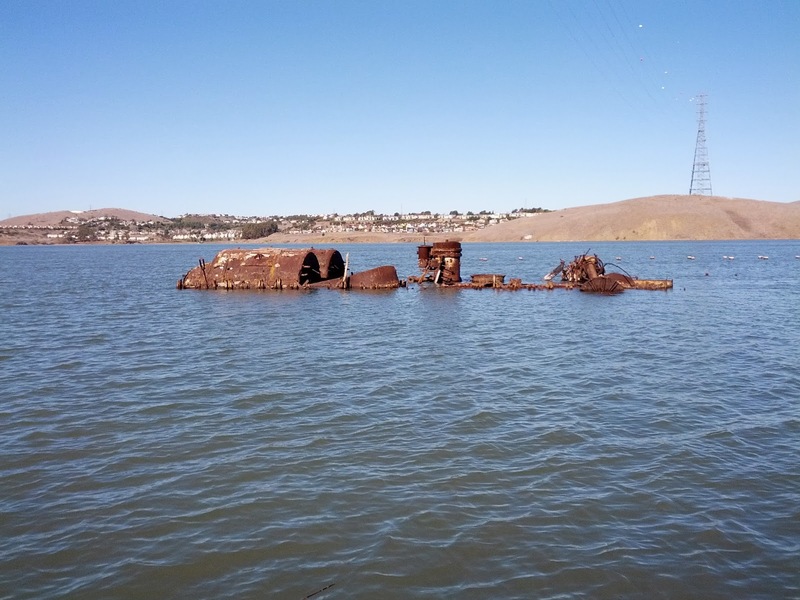 You had to figure out what this hunk of junk was doing in the Carquinez Straits, midway between Sacramento and San Francisco. The answer to that meant we had to learn about how to search for archival information, even in pretty out-of-the-way locations. 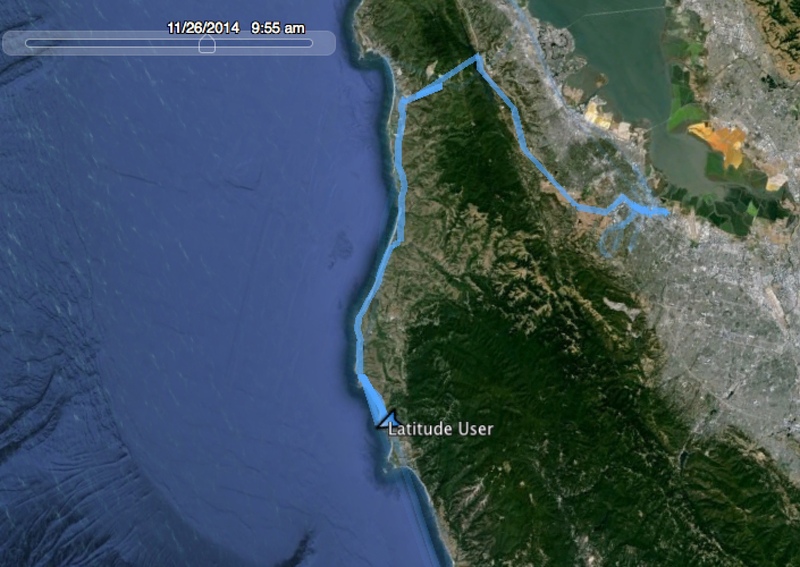 We learned out to get EXIF data out of cellphone photos, and then use the lat-long to locate interesting features on Maps. It was a good one, and voting with your clicks and visit is a great way to get my attention. Looking at the comments on this week's Challenge, it's clear to me that the most interesting Challenges are often the most difficult ones. I hope you find them educational AND entertaining; that's certainly my intent. People seemed to like the newsy Challenges, as well as the ones that need Maps (or Geo information), and finally, people liked the tough data challenges, especially the ones that meant learning new visualization methods. But the biggest takeaway was that things are going along pretty well. As always, I'm all ears, and will happily listen to good ideas about how to steer the blog along paths that are interesting to the SearchResearchers. And yes, I'll write one more post about the Twain challenge. I've actually done a fair bit of hacking around on that one, and I'll tell you about it next week before we close off the year with the special Year-End Search Challenge. Here's to a Healthy & Happy holiday and New Year to all Researchers everywhere! 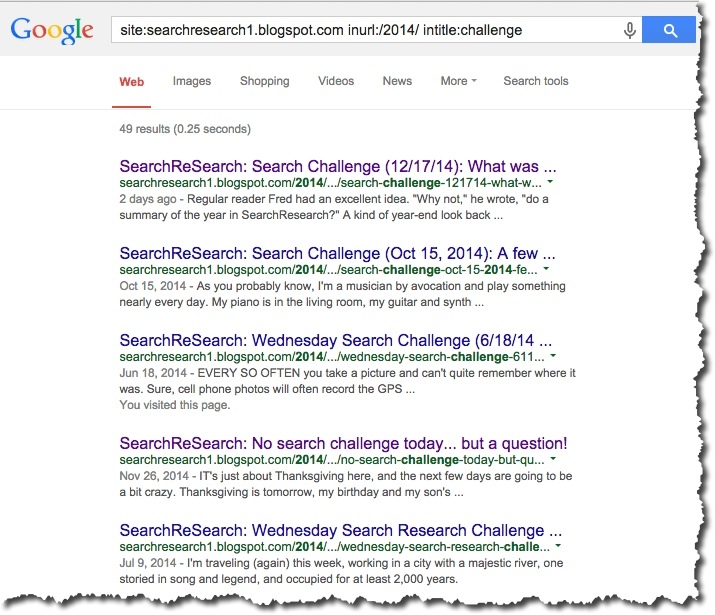 Search Challenge (12/17/14): What was the best Challenge of the year? Snow in the Sierras. The best thing we Californios could have at the end of 2014. I like that! I'll write up my summary of what I thought went well, and what didn't for Friday's post. 1. 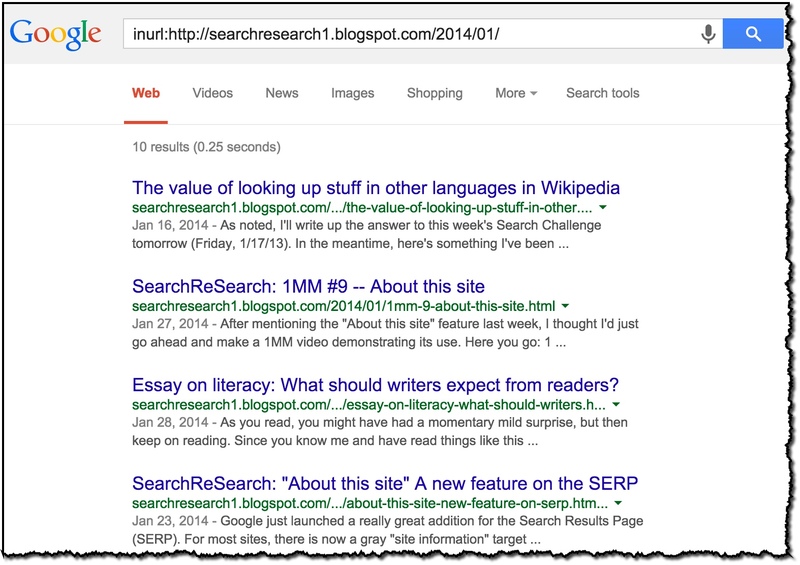 What was your favorite SearchResearch Search Challenge of 2014? (If you must, feel free to slip back into 2013--we never did a summary of that year.) Tell us what you liked about the Challenge you enjoyed the most, or what you learned from it. That means I'll post a Challenge that day, but it's going to be the most challenging Challenge of the year. I'll be back online on January 6th to look at how things have been going, and I'll be sure to give lots of hints in my Challenge writeup--but be prepared. I think you'll all have to work together to solve this one! It'll be a great wrapup for the year of SearchResearch. As you know, Google keeps changing the set of services it offers. Sometimes things are removed for simplicity or cost reasons, but sometimes things are also added to the mix. Chichewa (Chinyanja) is spoken by 12 million people in Malawi and surrounding countries. Malayalam (മലയാളം), with 38 million native speakers, is a major language in India and one of that country’s 6 classical languages. 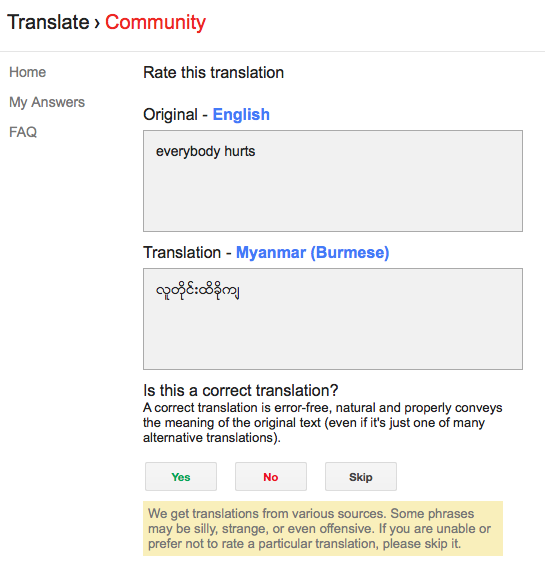 Myanmar (Burmese, မြန်မာစာ) is the official language of Myanmar with 33 million native speakers. 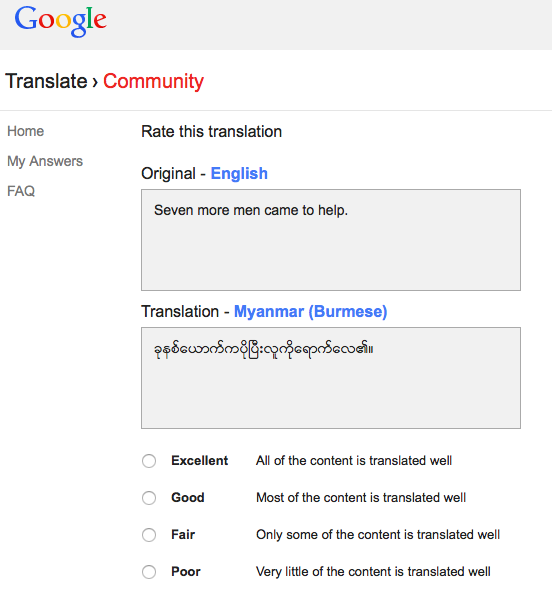 Myanmar language has been in the works for a long time as it's a challenging language for automatic translation, both from language structure and font encoding perspectives. Sinhala (Sinhalese, සිංහල) is one of the official languages of Sri Lanka and natively spoken by 16 million people. In September the local community in Sri Lanka organized Sinhala Translate Week, contributing tens of thousands of translations to the Google translation system. Sundanese (Basa Sunda) is spoken on the island of Java in Indonesia by 39 million people. Kazakh (Қазақ тілі) with 11 million native speakers in Kazakhstan. Uzbek (Oʻzbek tili) is spoken by 25 million people in Uzbekistan. The Uzbek dictionary by Shavkat Butaev is also now available. This week's Challenge was intended to get us thinking about the questions. As many of you correctly pointed out, even questions that sound simple often have a certain amount of ambiguity in them. Why was the Civil War fought? Who won the War of 1812? I can't find War & Peaches. What's that book all about anyway? As you see, you can't just flat out answer these questions. At the reference desk, the ref librarian conducts a reference interview to figure out what the asker really wants to know (and how much they'll understand). "Why was the Civil War fought?" Great question. Just saying "slavery" is inadequate. Instead, the librarian will talk with you--what do you really want to know? The economic conditions? The history of abolition? Political tensions between the states? Likewise, answering "how deep is the Grand Canyon?" and "Who won the War of 1812?" depends a lot on where you stand and how you take the measurements. Of course, War & Peaches is really a mondegreen of the Tolstoy book title, War & Peace. 1. 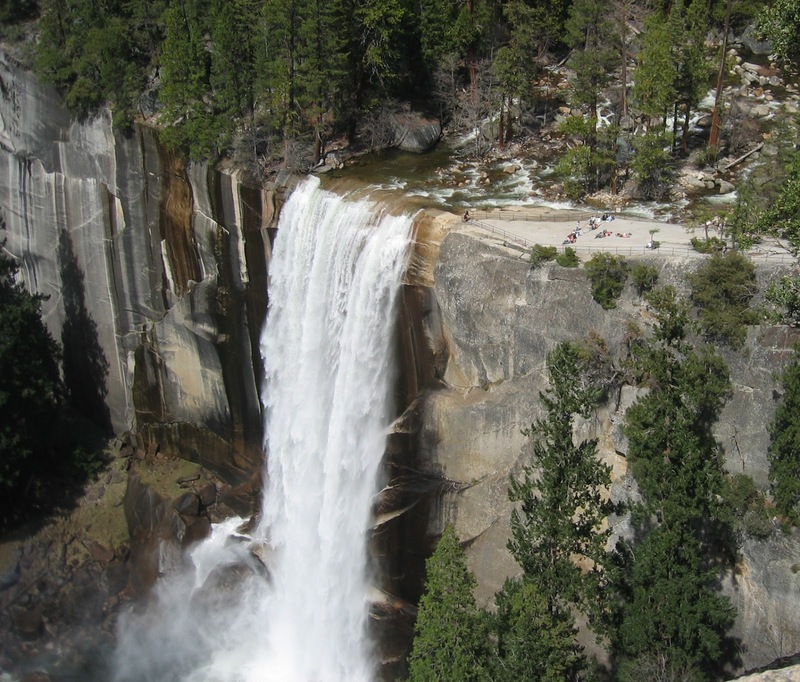 What is the elevation of Vernal Fall? 2. 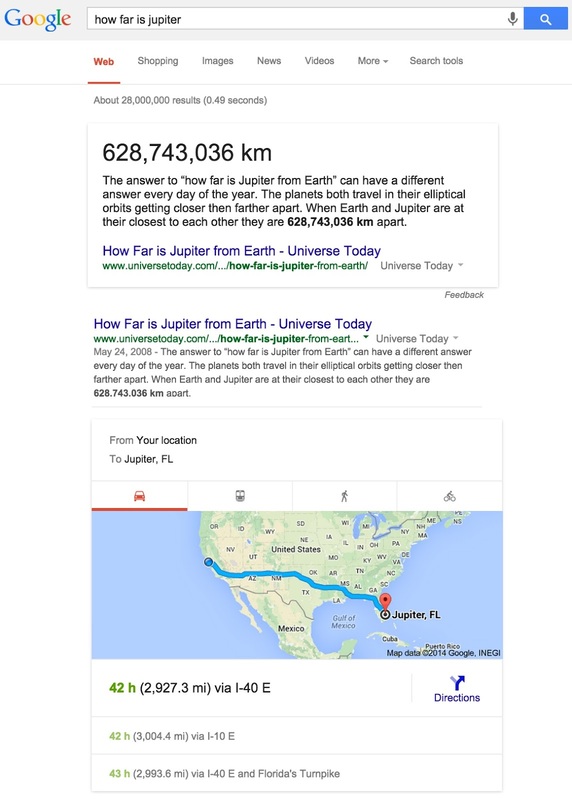 What is the distance to Jupiter? 3. How big is a 2x4 ("two by four") piece of wood? The ambiguity of the questions becomes pretty evident once you start to look for the results? 1. "The elevation of Vernal Fall?" Well, tell me what you mean by "elevation"? Is that the altitude above sea level of the top... or the bottom of the falls? Or could you mean the distance the water falls from lip to base? You have to read this result carefully. Note that the search term "elevation" is bolded in the result snippets. It's a big hint that elevation might not mean what you think it means. If you click through the first couple of results, it becomes clear that "elevation" here means "height above the Yosemite Valley floor." The number (1,014 m) is extracted from a number of web pages that are hiking guides. For that purpose, "elevation" is a good number to indicate how difficult of a hike it is. Now if you thought "elevation" meant "altitude," you'd be completely misinterpreting the result. 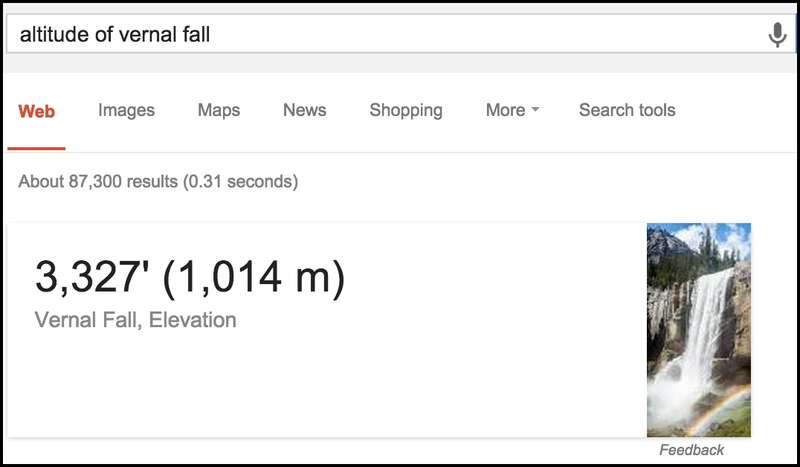 Unfortunately, if you do a more precise query [ altitude Vernal Fall ] you'll still get the same answer because Google synonymizes "elevation" and "altitude." See? Note carefully what it says in grey text below the number: "Vernal Fall, Elevation"
Of course, that's not what you intended. 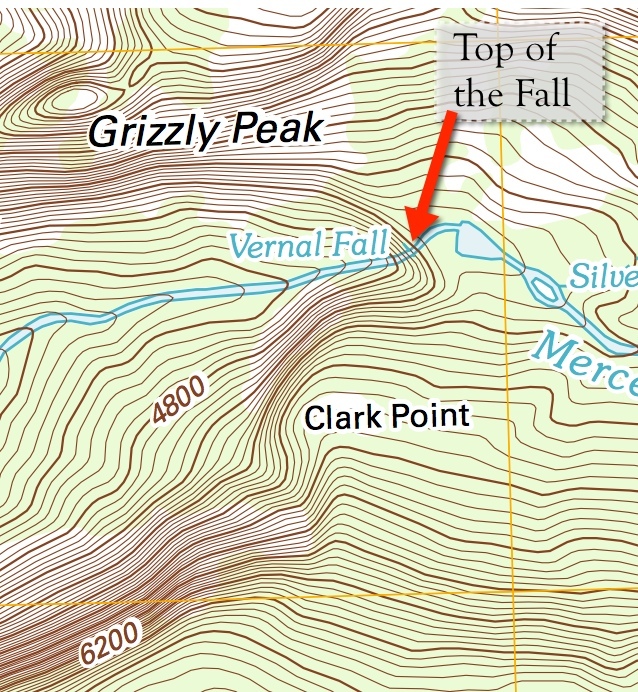 You asked for "altitude"
If you want the altitude of the top (or bottom) of the Fall, you'll need to look at a map or find a guide to Vernal Fall that gives it to you explicitly. 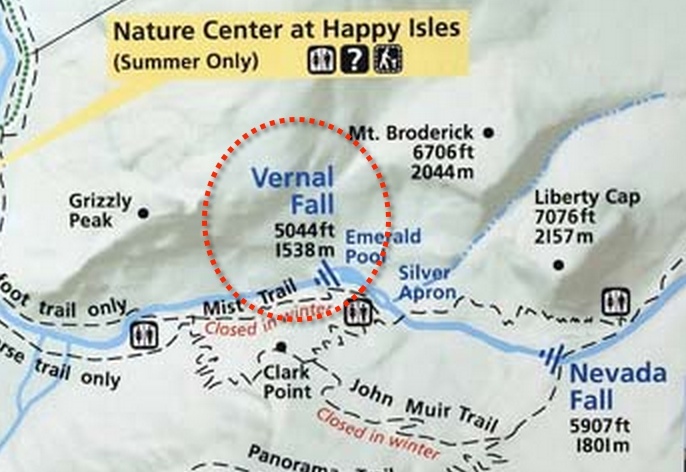 The official National Park Service Yosemite Valley Map shows that the Falls are at 5044 feet (1538 m). But is that the top or the bottom of the falls? See that elevation line at 4800? It's one heavy line below the top of the Fall. (Trace it with your finger.) 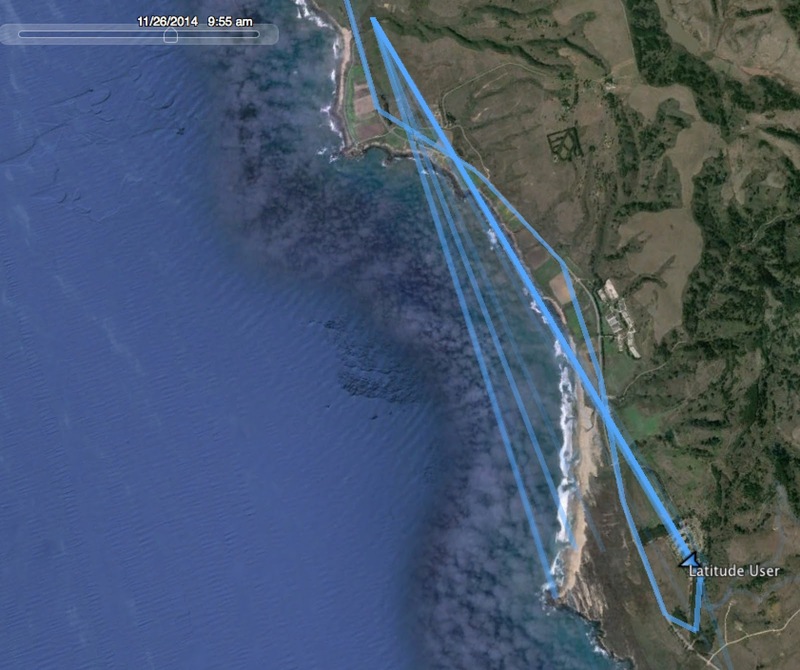 The legend at the bottom of the map says these lines are 200 feet apart. So the heavy elevation line that passes just below the top of Vernal Fall is 5000 feet. So the NPS map's number (5044 feet; 1538 meters) checks out. 2. "Distance to Jupiter?" Well, tell me what you mean by "Jupiter"? And then tell me what you mean by "distance"? It seems silly to ask "what's Jupiter?" but don't tell that to the citizens of Jupiter, FL. If you're in Talahasee, FL, "what's the distance to Jupiter?" probably means "how long will it take me to drive to the town of Jupiter!" As the first answer box points out--the distance from Earth to Jupiter varies day-by-day. If you read the result carefully, it says "at their closest.." they can be 628,743,036 km apart. But what about at their farthest? I'll let you look that up, but it's a long way from one side of the solar system to the other. The distance changes moment-by-moment. Of course, the other interpretation could be "how far is Jupiter from the sun?" If that's the real question, then you have to ask "do you want the distance from surface of the sun to the surface of Jupiter?" or do you just want center-to-center? The Nasa.gov site puts Jupiter (center-to-center) at 5.2 AUs (Astronomical Unit, which is 1 Earth-t0-Sun distance of 93M miles). So from Sun-center to Jupiter-center is around 483M miles (777M km). 3. "How big is a 2x4 piece of wood?" Well, tell me what you mean by "big"? Usually people think of a 2x4 as a standard measure. As Wikipedia tells us in the article about lumber: "...a "2x4" board historically started out as a green, rough board actually 2 by 4 inches (51 mm × 102 mm). After drying and planing, it would be smaller, by a nonstandard amount. Today, a "2x4" board starts out as something smaller than 2 inches by 4 inches and not specified by standards, and after drying and planing is reliably 1.5 by 3 .5 inches (38 mm × 89 mm). It is made to absorb natural variation." This is backed up by the article on Wood Sizes from the WoodWorking.com site, which also points out that lumber sizes vary depending on if its softwood (e.g., pine lumber) or hardwood (e.g., oak) that's being measured. Of course, there's the issue of length. The actual weight (or volume) of a single 2x4 can vary tremendously depending on length. In the United States and Canada the standard lengths of 2x4 lumber are 6 feet (1.83 meters), 8 (2.44), 10 (3.05), 12 (3.66), 14 (4.27), 16 (4.88), 18 (5.49), 20 (6.10), 22 (6.71), and 24 feet (7.32 meters). The upshot is that a "2x4" is actually smaller than the term would suggest, and the largest variation is size (that is, "how big it is") depends on its length--from 6 feet up to 24 feet. Like a great reference librarian, when you're searching, you really want to understand the question that is being asked. You have to take into account the variation in what the original question statement is, and the variation in what your reference materials (including Google!) can tell you. 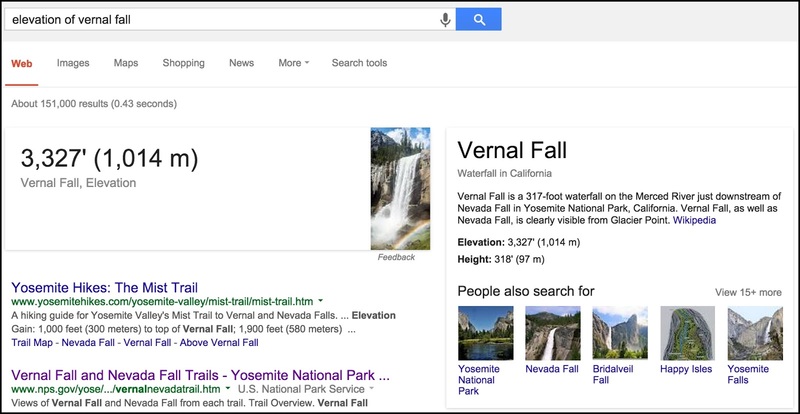 As we see in the Vernal Fall elevation example, you must read the content carefully. This is probably the single biggest source of mistakes I see in students. Even if they frame the search carefully and correctly, but then misread the results, then they're still wrong, even though they did everything right up until the last step. Answer--part 3: What's going on in this file? Let's start with the simplest way to analyze the KML file. 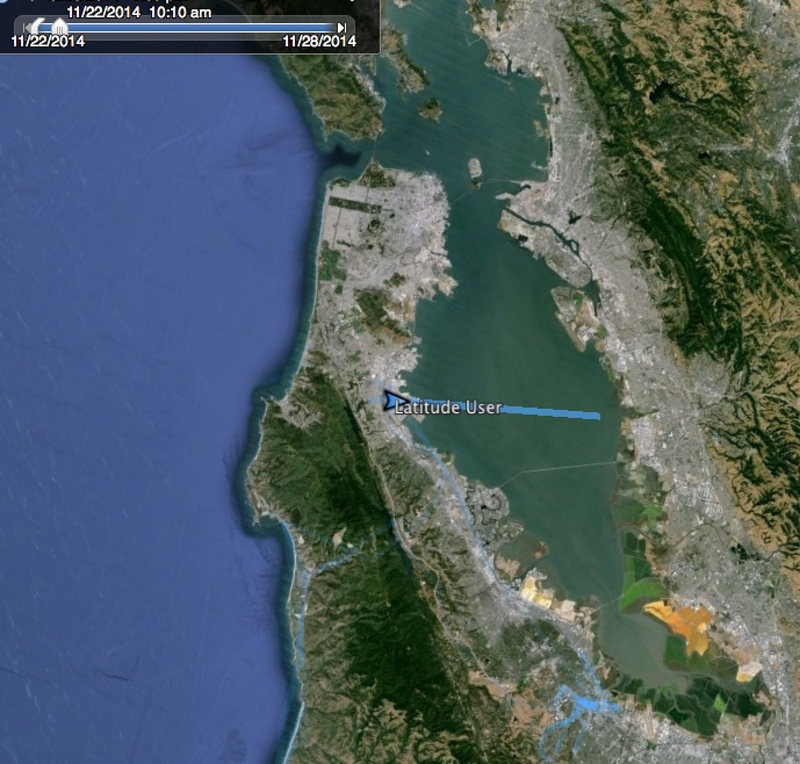 As several of you found out, importing the KML file into Google Earth makes it very clear what's going on. Here's what I see when I import it. 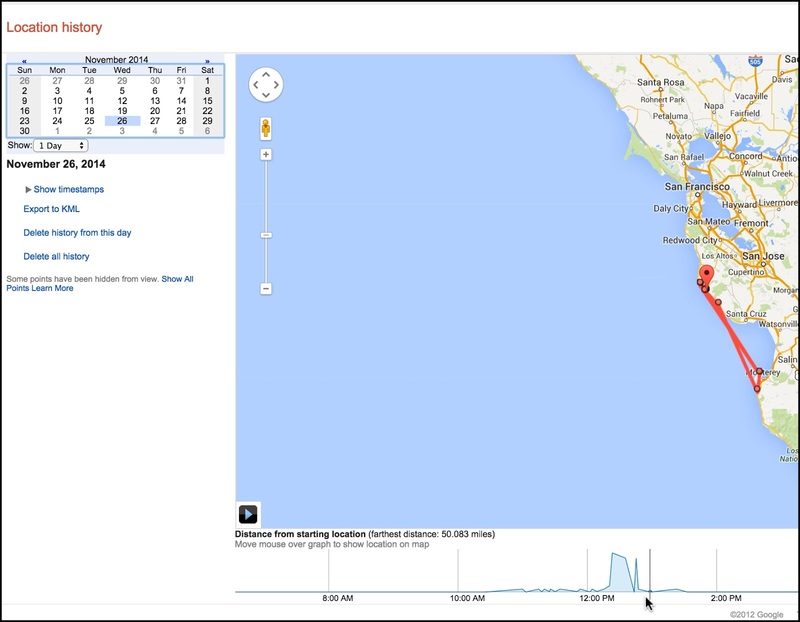 (It's labeled "Location history from 11/22/20..." on the left hand side panel below. Notice the scrubber in the upper left. It looks like this. (Note the "house shaped" icon that indicates the end point in the timeline being shown. 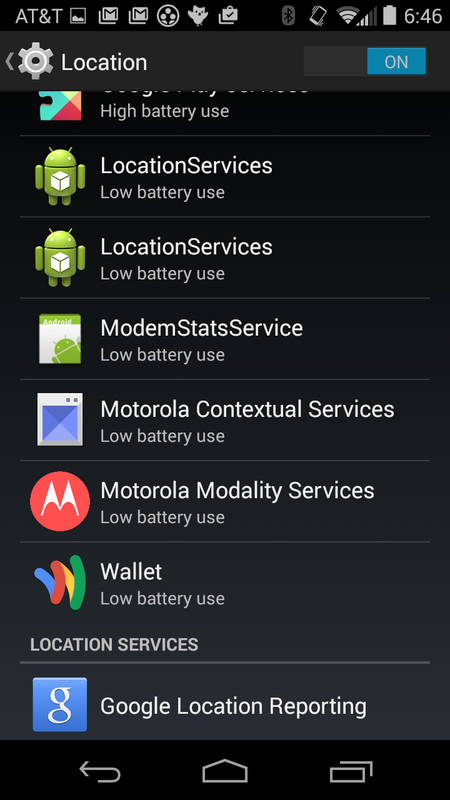 Note also the "crescent moon" shaped icon that indicates the earliest time of the data being shown. With this widget, you can scrub along in time and follow the track of the phone. If you click and drag on the "moon" and "house icons", you can select the segment of time on the KML track that you want to see displayed. Here I'm looking at the track from 8AM on 11/27 up to 8:47AM on 11/28. Using this slider widget, you can find out remarkable things. 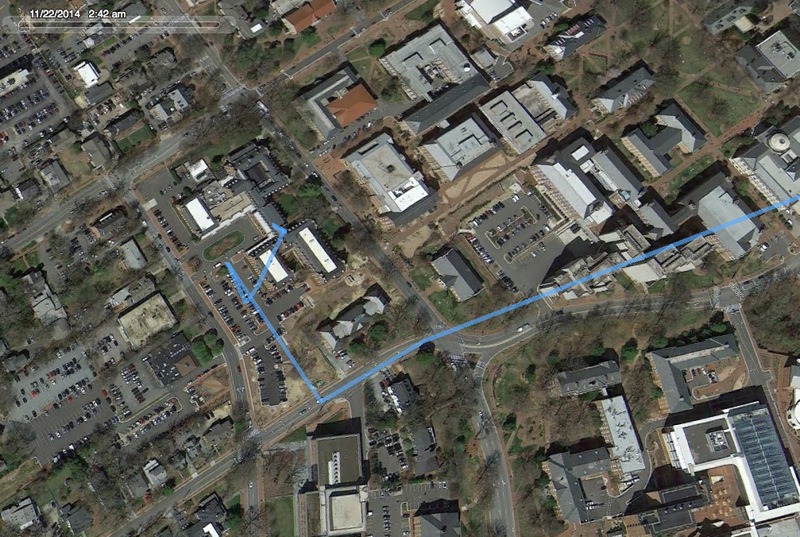 As several of you figured out, the track starts in North Carolina, in the parking lot of the Carolina Inn, Chapel Hill. this gives me a clickable red dot for each "known place" in the map. 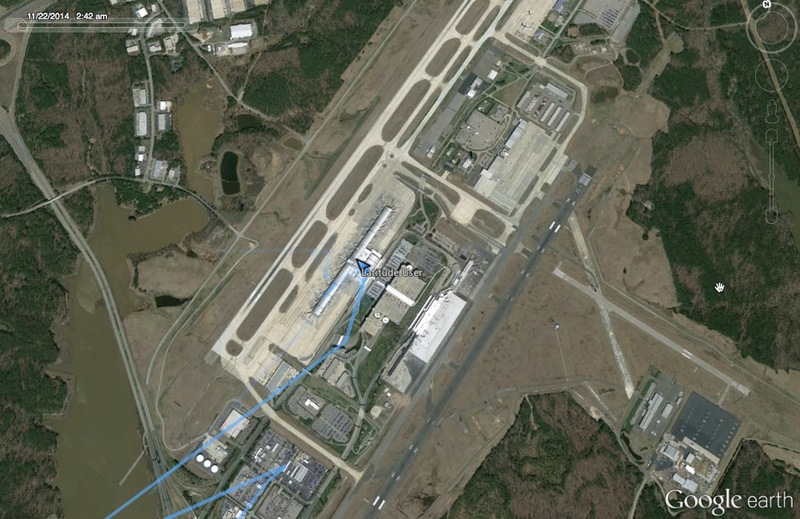 Fast forwarding the track a little bit, you can see that the phone went to the Raleigh-Durham airport... and then was turned off. You can keep on going like this--zooming in to see the fine details, and by looking at the time slider, you can figure out the time of day. 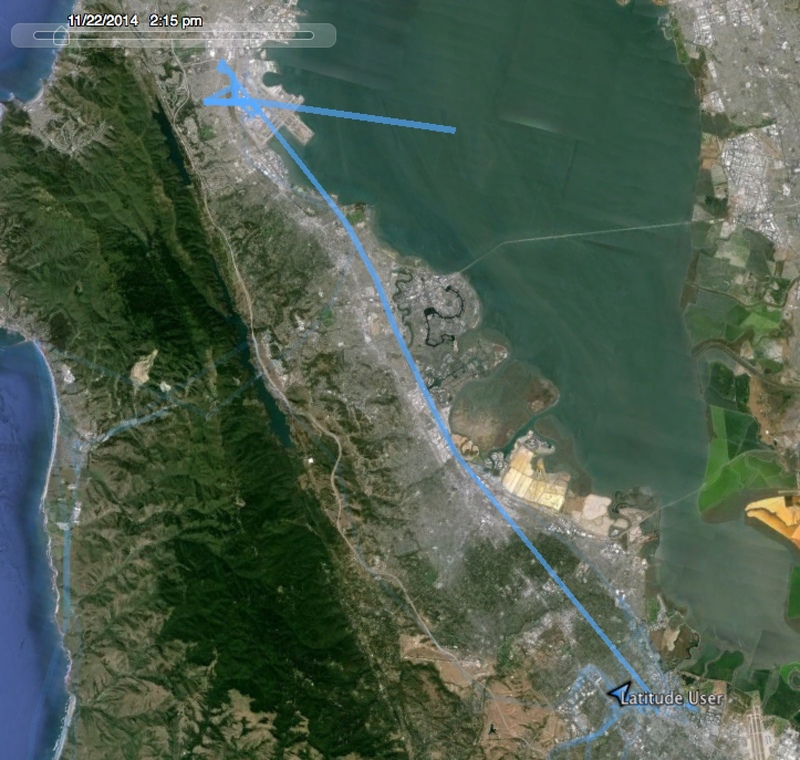 Below you can see that the phone landed at the San Francisco airport (SFO) around 10AM local time. Sliding forward a bit more in time, you can figure out what this trip is into the hills. From the speed chart, we know the speed varied from 25 mph to around 4 mph. 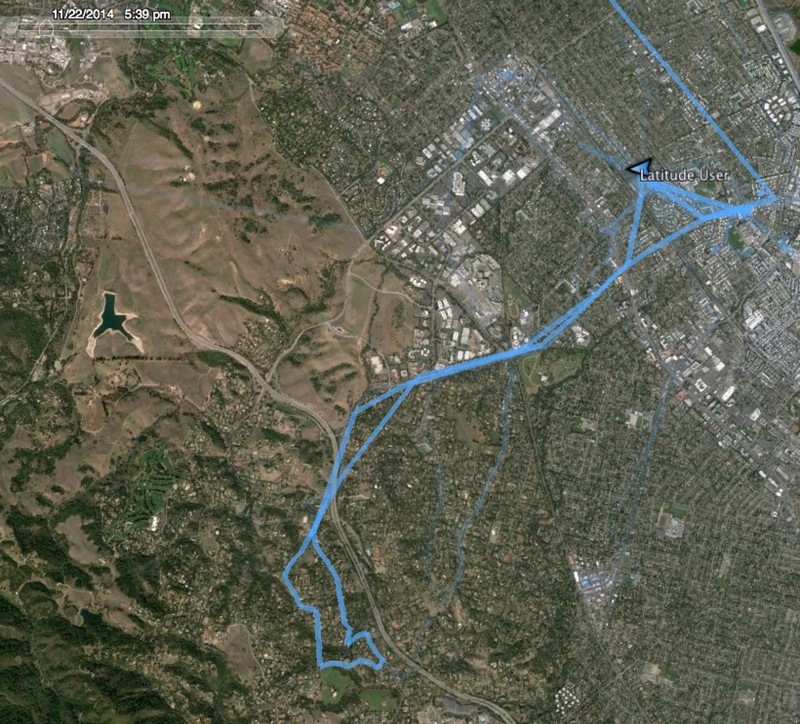 If you zoom in even farther on maps, you'll see that some of this track is off-road, on trails in the Los Altos Hills. The speed for that section is slow... This is driving to a running location! Going forward a couple of days (to 11/26), you can see a trip to the coast. Doing the same trick as before [* ] you can figure out that this is a quick overnight trip to the Costanoa Lodge. But you have to be a little careful when interpreting this data: sometimes you'll get spurious data points. As you can see here, several of these points seem to zip back and forth to an odd location (the focus at the top of the image). If you find these points in the data set, they're really odd--very rapid back and forth. Since I can't really travel at that speed (>100mph), they're really just jitter in the GPS signal. There's another spurious value here. (The big spike going to the left.) On the whole, the data is good--but this is why you compute speeds (as we did on Tuesday).... it makes it simple to find the broken data points. What this KML tells us.... The KML file starts in Raleigh, NC, and travels to San Francisco on Nov 22. After a couple days of traveling back and forth between work and home (and it's very easy for you to figure out which is which! ), you can tell that I took a quick vacation over to the coast. 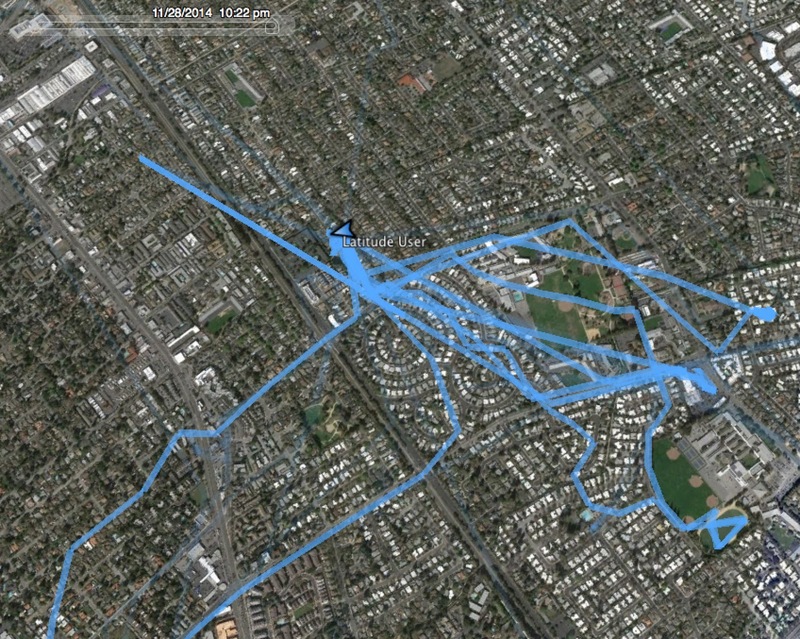 If you look carefully, you can even see where I went for a run, where I went for a bike ride, and where my favorite morning coffee shop is located! There are many lessons here... let's start with the obvious. 1. 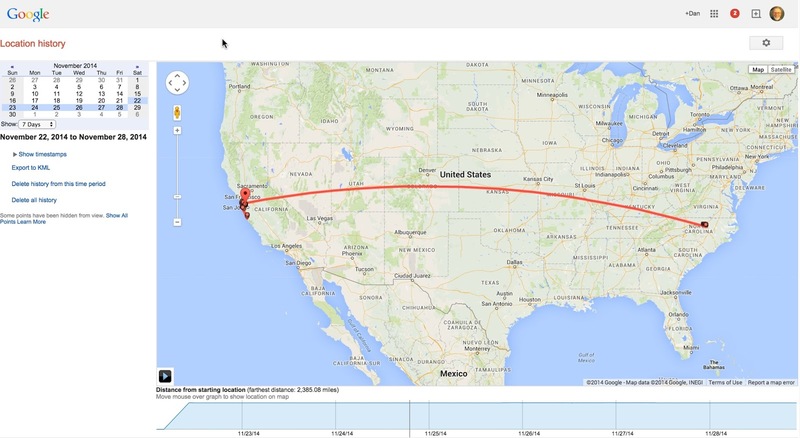 A cell phone track can tell you a LOT about what a person is doing. In this case, it's just my cell phone GPS locations. But you want to be aware that your phone has the capability of tracking your movements, and giving anyone who has access to that data a VERY deep insight into what you do. In my case, I use this tracking information to geocode my photos, and on occasion, I can figure out where that interesting place I visited while driving. That is, I can reconstruct where I went... sometimes that's exactly what I want to do. 3. 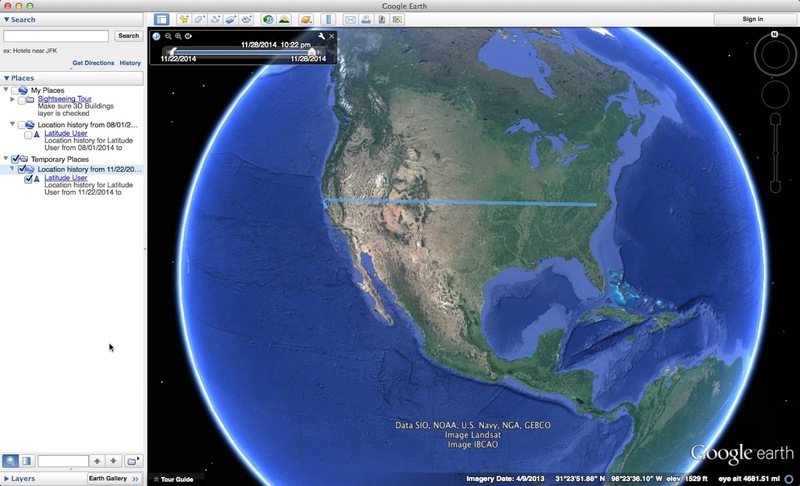 The mode switch from Google Earth to Google Maps can be useful. 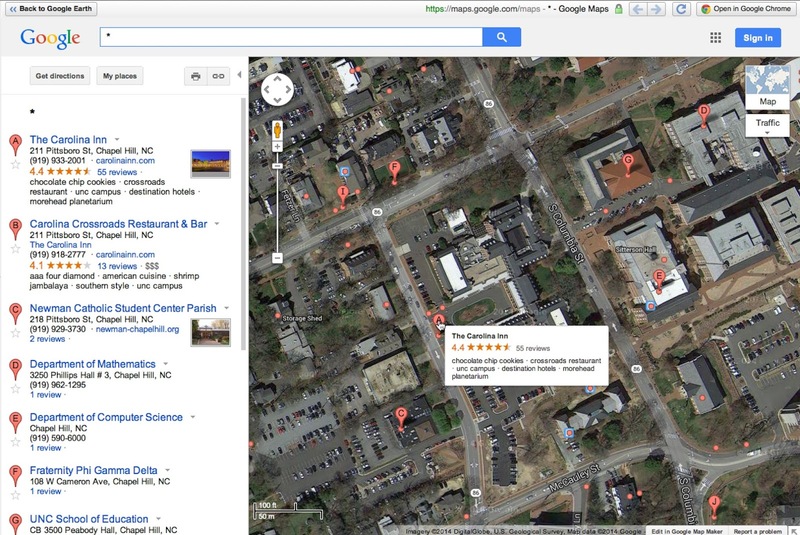 You can use several of the methods you know in Maps (e.g., [ * ] or StreetView) to get additional data. The deep lesson here is that you should learn the different viewing modes for any data viewer (e.g., Maps, Earth, Google Charts, or Plot.ly). Switching between viewing modes is often a way to get deep insights into your data very easily. 4. Zooming in can often reveal lots of data. Don't stay just at the most distant view; zoom in and out to get the details (when zoomed way in), and the context (when zoomed way out). 5. Know your tools. The Google Earth time slider has a "current" slider (the little "house" shaped icon) and a "previous point" slider (the "crescent moon" icon). Now you know, and now you're empowered to make your own choices. As the result of a new Spanish law that will go into effect on January 1, 2015, Google has decided to stop serving Google News in Spain. 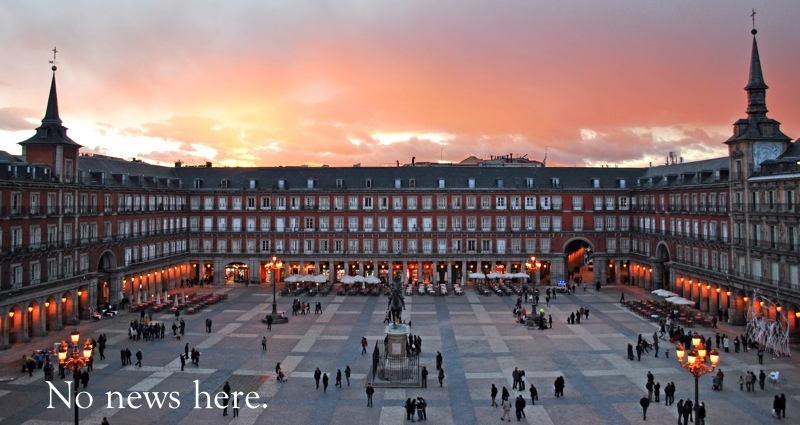 The Spanish law is simple--if any internet service provider (such as Google News, Facebook news clippings, Daily Slate, etc.) uses any part of a news article from a Spanish news source, they have to set up a licensing deal. That is, Google (or FB or DS, has to pay them for each use... Even if it's just a headline and a link to the paper, you still have to set up a deal and pay them for that use. The reasoning on Google's part is equally straightforward: Google doesn't run any advertising on News, so it's really a loss-leader, a kind of public service that lets people see a broad spectrum of the news across a wide number of sources. That was Krishna Bharat's intent when he set it up originally, and that's what it still does. You can read the official Google Blog post here for all the details. But it's a sad day for Spanish news readers. I hope that the Spanish publishers, as the German news publishers did a few months ago, discover that they're getting a LOT of traffic from Google News, and revert the law back to the way it is now to avoid losing half of their organic traffic. Answer--part 2: What's going on in this file? Answer--part 1: What's going on in this file?